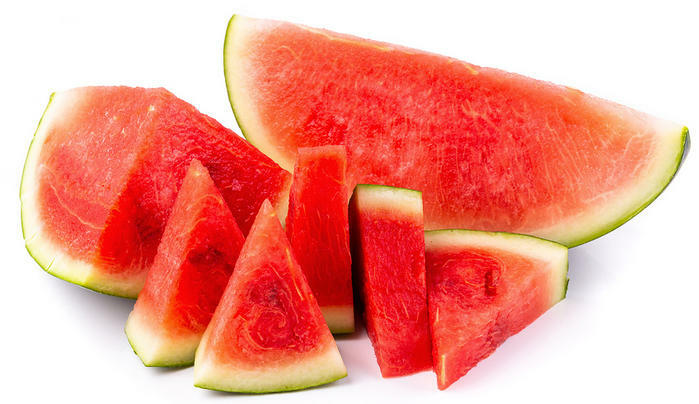 Watermelon has fructans, mannitol and excess fructose, and is one of the foods eliminated during the first phase of the low FODMAP diet. The low FODMAP diet was created to help people suffering from gastro issues such as irritable bowel syndrome (IBS) reduce their symptoms. The goal is to eliminate certain foods that often act as triggers of symptoms. The diet was created by researchers at Monash University in Australia. Researchers discovered that certain short-chain carbohydrates are often not absorbed correctly and this can trigger symptoms. Eliminate all known FODMAPs to clean our your system. Test each FODMAP to figure out which ones cause your symptoms and how much you can consume without ill effects. There are four types of short-chain carbohydrates (sugars) that are FODMAPs. Oligosaccharides – Fructans and GOS. These are often found in wheat, onions and garlic. Because of this, breads and many gluten-containing products are eliminated. It’s not the gluten that’s an issue; it’s the fructans. Disaccharides – Lactose. Thankfully, because lactose-intolerance is so common, there are many lactose-free products to choose from at your grocery store. Monosaccharides – Fructose. Yes, fructose-intolerance is a thing. While fructose is common in fruits, some fruits are OK to eat if they have more glucose than fructose. But all of those products you buy with high fructose corn syrup…those are a problem! Polyols – Sorbitol & Mannitol. These are in some fruits and veggies and are used as sugar substitutes in things like sugar-free gum. It’s important to see a trained nutritionist before beginning the low FODMAP diet. They will help you understand exactly which foods you need to eat in order to meet your nutritional needs. A nutritionist can also help you understand how to test foods after the elimination phase, which can last anywhere from one week to months depending on how you respond. This site has many resources for people on the low FODMAP diet, including food tips, apps, restaurant guides, and breath test information. ← What is Irritable Bowel Syndrome?